From teller to manager, Barbara Cherry held just about every job someone can across the nearly 30 years she spent working in the banking industry. Every job, that is, except the position of bank president or vice president. Arts and crafts are more enjoyable for Barbara following cataract surgery. “I did everything else but never quite reached that level,” confirms Barbara, who is now retired and living comfortably in St. Petersburg, where the bulk of her activities revolve around a church group performing charity work. 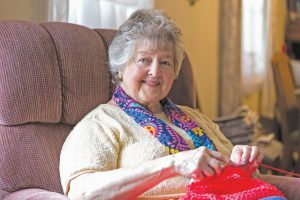 “I like to crochet, and I’m part of a little organization at the church that does a lot of crocheting and knitting for the birthing clinics in the area,” she says. “We also make sleeping mats for the homeless. Covering that territory became a little more difficult for Barbara a couple years ago after she learned during her annual vision examination that she was beginning to develop cataracts. “At the time I learned about the cataracts, the doctor told me they were still too immature to do anything about,” Barbara adds. “I was aware of them, though, and sure enough, as time went on, I began to notice the effects. “I noticed at first that it was becoming a little bit harder to read. I needed a little more light to read than I had before. Then I began to notice halos around the lights at night when I was driving and a little more glare than I was used to seeing. “I cut back on my nighttime driving after that, and then, when I went in for my annual eye exam again late last year, the technician said, Wow, your vision has really changed a lot, and he asked me when my next driving test was. 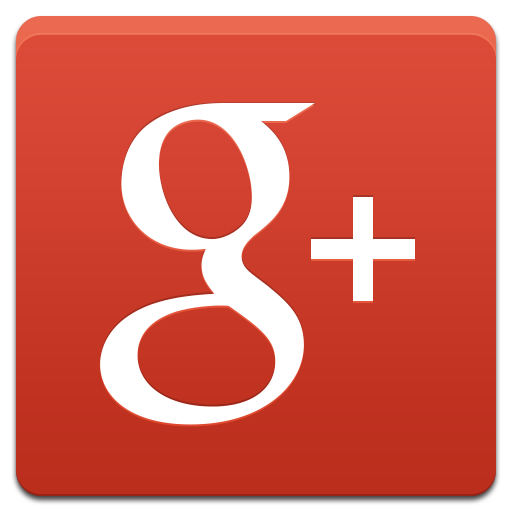 Dr. Hall is David E. Hall, MD, of Pasadena Eye Center. 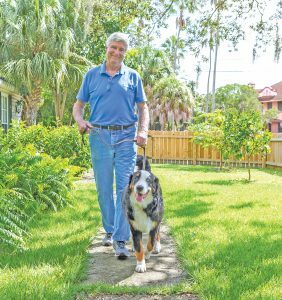 The board-certified ophthalmologist has been treating Barbara for many years and has earned her trust to the point where she didn’t hesitate when he suggested the time had come to remove her cataracts. percent of all people 65 or older. Cataracts usually develop from a breakdown of the eye’s lens fibers, a clumping of the eye’s proteins, or both and typically cause blurred vision, an increase in sensitivity to light and a reduction in color vibrancy. Though cataracts tend to develop slowly over a number of years, they can be corrected quickly and easily through an outpatient procedure in which the natural lens is removed and replaced with an artificial intraocular lens, or IOL. At Pasadena Eye Center, cataract patients are given an array of tests prior to surgery to evaluate the overall health of their eyes and their suitability for surgery. A test is also conducted to determine the most appropriate IOL for each patient. Standard IOLs correct vision primarily for distance. Patients can also have one eye fixed for distance vision and the other corrected for reading, an option called monovision. A third option is premium IOLs that correct vision for both distance and reading or close-up work, eliminating the need for glasses of any kind. The only exception was that Barbara had an astigmatism, which is another common condition that occurs when the cornea is not as perfectly round as it should be. Dr. Hall says about 80 percent of all people have at least a moderate degree of astigmatism. “Since the majority of people have some sort of astigmatism, that’s something we’re always looking for when we do cataract surgery,” Dr. Hall adds, “because standard lenses don’t correct astigmatism. “When we put regular implant lenses in, they correct everything else, such as nearsightedness or farsightedness, but they don’t correct astigmatism. We have something called a femtosecond laser that does. “The femtosecond laser resyncs or reshapes the cornea to make it rounder. That’s one of the big advantages of having and using the laser. Another is that it basically performs the first several steps of the surgery, including the incision. “It starts by opening up the little lining around the cataract, the capsule. It then divides the hard center part of the cataract, which is known as the nucleus, into tinier pieces that are softer. That makes it easier to suction those pieces out. “Because they’re smaller and softer, those pieces can also be suctioned out more quickly. That shortens the procedure time. It cuts it about in half, and because we’re in the eye for a shorter period of time, there’s less irritation on the eye. “The bottom line is that the femtosecond laser allows us to be a little bit more precise during the surgery, and because it eases the irritation on the eye and results in less inflammation, it leads to a better outcome for the patient. Cataract surgery is usually performed one eye at a time, with the patient taking a one- or two-week break before having the second eye corrected. Barbara had her first surgery, on her right eye, the first week of November of last year. She had surgery on her left eye two weeks later, and she was so pleased with the relative ease of the surgeries themselves and with the outcome that she called the entire procedure an early Christmas present. “Everything went like clockwork,” she enthuses. “I was afraid at first that I was going to have an anxiety attack or something during the surgery, but they make you feel very comfortable and at ease, and everything went really well. “I remember seeing so much better after the surgery. It really does make a difference. You don’t realize how bad your vision has become until after the surgery, when you’re seeing so clearly again. Though immersed in a world of science fiction and fantasy, about which he writes award-winning short stories, novels and novellas, Rick Wilbur also returns to Earth as a professor of journalism, mass media and creative writing. These pursuits necessitate long hours of intense research and reading, so Rick’s vision is precious to him. Always the storyteller, Rick shares the tale of how his family discovered his need for glasses. His father, a major league baseball player, frequently took his five children to his games. It was at one of those contests that Rick’s poor vision was discovered. 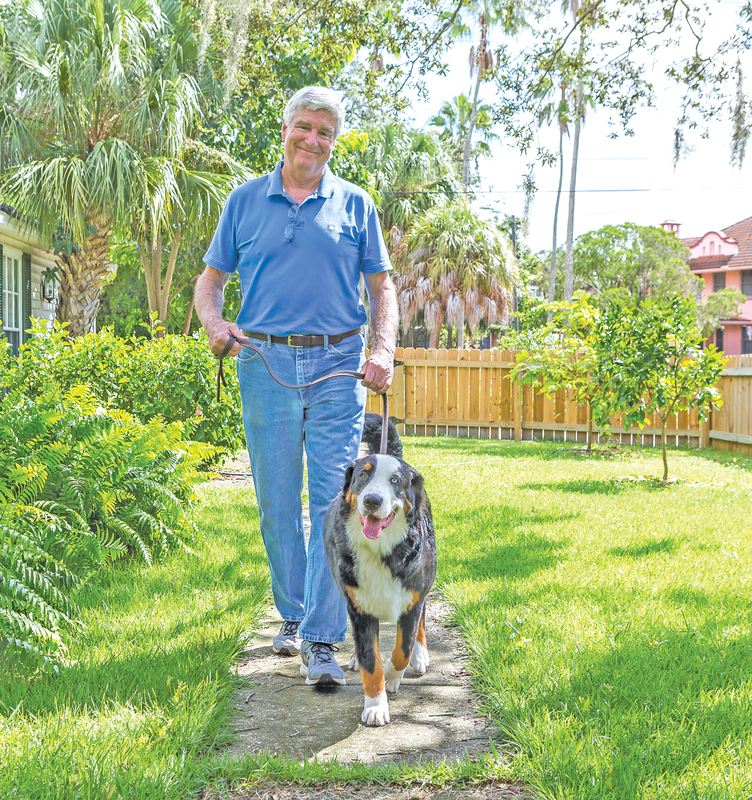 For Rick, cataract surgery proved to be a revelatory moment. “We were at a game and I asked my father, Why do they even bother with the scoreboard since nobody can read it?” Rick relates. “My father looked at me and asked, Can’t you read the scoreboard? Many years later, Rick experienced another revelation regarding his vision. This one came during an annual visit to his eye doctor, Dr. Hall, who was unaware at the time that Rick had been experiencing several symptoms of cataracts. “Dr. Hall said, You know, you have some cataract issues,” Rick recounts. “I didn’t realize that. I had noticed I was cleaning my glasses all the time. I thought they were dirty. It was humbling that it didn’t occur to me that the problem was with my eyes, not my glasses. Dr. Hall recommended surgery to remove the cataract he found in Rick’s left eye because that cataract had matured and needed to be removed. The cataract Dr. Hall found in Rick’s right eye was not as mature and therefore did not require surgery at that time. “Since I’m a writer, I work on my computer for hours every day and then read from my Kindle or print books,” Rick discloses. “I needed to see at about fifteen inches and then at ten to twelve inches, so I went ahead with the surgery. Rick was so impressed with the outcome of his first surgery that he decided to have the surgery done on his right eye as well. The second procedure was completed less than a year after the first. Dr. Hall’s initial examination of patients such as Barbara and Rick always includes a test to determine whether they are suffering from macular degeneration, a retinal disease that can also cause blurred vision, particularly in people over 50. Patients are also tested for glaucoma. “Initially, we perform a routine eye exam during which we check the strength of the eyes and their general anatomy,” notes Dr. Hall. “We then dilate the pupils to examine the backs of the eyes, the retinas and optic nerves. “If the patient’s eyes are healthy and they decide to go ahead with the cataract surgery, we have them come back for a topography test, which examines the shape of the cornea, or the front part of the eye. Another test performed prior to cataract surgery is the OCT retinal scan. The OCT scan checks for any problems that may be hidden under the surface of the retina and are unable to be seen under normal light. The OCT scan exposes conditions such as swelling and scar tissue, which if serious, can interfere with the success of some premium IOLs. “We obtain the measurements for calculating the lens implant prescriptions two ways,” explains Dr. Hall. “One is with light energy, and the name of the instrument we use is the IOLMaster®. The IOLMaster measures the length of the eye from front to back, from the cornea to the retina. Much like Barbara, Rick is thrilled with the results of his cataract surgeries. He says he was initially overwhelmed by the improvement in his vision. “After my second cataract surgery, I had the same kind of revelation I did seeing that scoreboard at the baseball game,” he states. “I’d forgotten what really clear vision can be, and now, there it is. The surgery gave me back vision I haven’t had since my youth. “Now, I see well both up close and at a distance with my two eyes working together. That’s a very welcome change. And I’m fine when I drive at night. I see very clearly. I do wear glasses for reading, but I’m not sure I even need them. “I know people say this all the time, but I really wish I had this done sooner because the difference is remarkable. And I owe it all to Dr. Hall and the amazing staff at Pasadena Eye Center. Barbara learned that about 35 years ago when she and her husband first started seeing Dr. Hall. “We really couldn’t ask for more professional and skilled people,” she exudes. “The whole staff is trained in all aspects of eye care, so they have a good backup system and they all know what they’re doing and how to do it. “You go in knowing you’re going to get the best care possible and come out feeling confident and assured that everything went just as you hoped. That’s why I highly recommend Dr. Hall and Pasadena Eye Center.